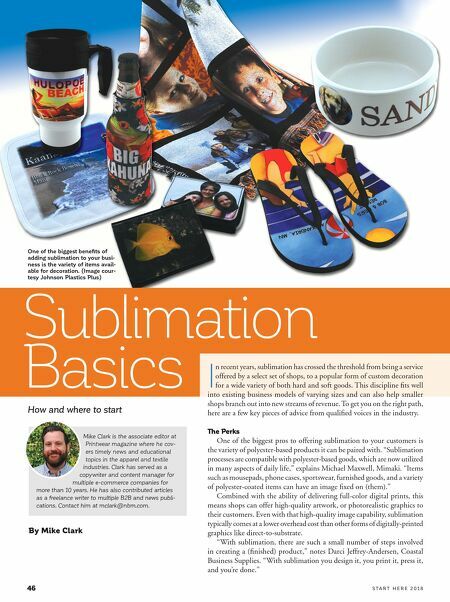 46 S T A R T H E R E 2 0 1 8 Sublimation Basics How and where to start By Mike Clark Mike Clark is the associate editor at Printwear magazine where he cov- ers timely news and educational topics in the apparel and textile industries. Clark has served as a copywriter and content manager for multiple e-commerce companies for more than 10 years. He has also contributed articles as a freelance writer to multiple B2B and news publi- cations. Contact him at mclark@nbm.com. One of the biggest benefits of adding sublimation to your busi- ness is the variety of items avail- able for decoration. (Image cour- tesy Johnson Plastics Plus) I n recent years, sublimation has crossed the threshold from being a service offered by a select set of shops, to a popular form of custom decoration for a wide variety of both hard and soft goods. This discipline fits well into existing business models of varying sizes and can also help smaller shops branch out into new streams of revenue. To get you on the right path, here are a few key pieces of advice from qualified voices in the industry. The Perks One of the biggest pros to offering sublimation to your customers is the variety of polyester-based products it can be paired with. "Sublimation processes are compatible with polyester-based goods, which are now utilized in many aspects of daily life," explains Michael Maxwell, Mimaki. "Items such as mousepads, phone cases, sportswear, furnished goods, and a variety of polyester-coated items can have an image fixed on (them)." Combined with the ability of delivering full-color digital prints, this means shops can offer high-quality artwork, or photorealistic graphics to their customers. Even with that high-quality image capability, sublimation typically comes at a lower overhead cost than other forms of digitally-printed graphics like direct-to-substrate. 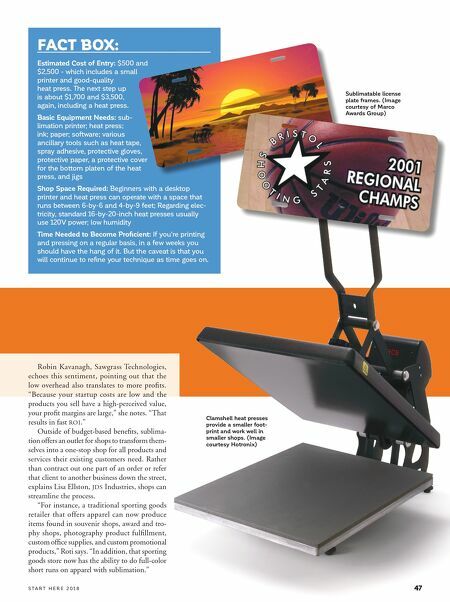 "With sublimation, there are such a small number of steps involved in creating a (finished) product," notes Darci Jeffrey-Andersen, Coastal Business Supplies. "With sublimation you design it, you print it, press it, and you're done."